Continuing my X-Men chronology, this week I want to explore a range that I personally feel is overlooked a little; Kieron Gillen’s run on ‘Uncanny X-Men’. Gillen took the reins of ‘Uncanny X-Men’ at a time of crisis for the mutant race, and – like his ‘Generation Hope’ series – he propelled the series like an arrow to the target of ‘AvX’. Not many X-Men writers can say they ended not one, but two series of Uncanny X-Men! Kieron Gillen joined Marvel to co-write the ‘Quarantine’ arc with Matt Fraction, and then took over the book from #534.1. When the events of ‘Schism’ brought Uncanny to a restart, Gillen penned the last issue and was then responsible for leading the ‘Regenesis’ brand in a new series of Uncanny. That particular series closed shortly after the events of AvX, and Gillen penned the ‘AvX: Consequences’ miniseries to tie up both his own loose ends, and those of AvX. The last page of AvX: Consequences – the mutant race is restored, and Gillen puts Cyclops, Magneto and Magik in place for Bendis’ run! As that quick summary indicates, the Gillen run is almost unique in that it is so firmly embedded in the continuity of the time. 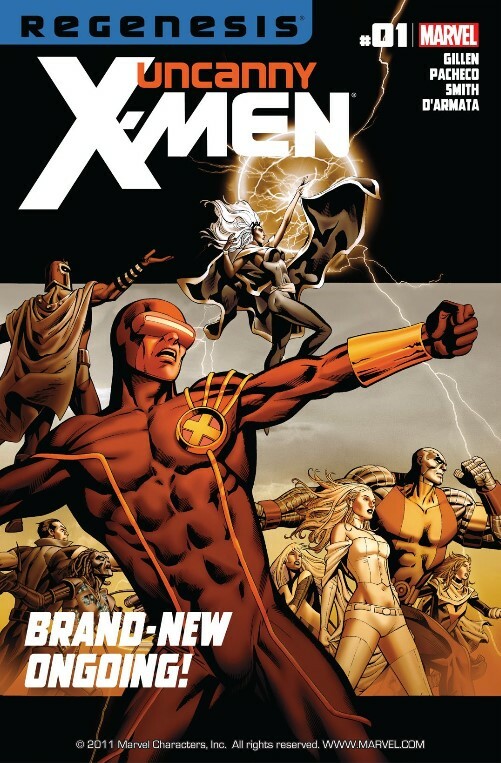 Gillen had already been writing ‘Generation Hope’, and was well aware of the trajectory of the X-books; his goal from the outset was to set up AvX, in an effort to ensure the battle between the X-Men and the Avengers was inevitable. Along the journey, Gillen was profoundly influenced by both ‘Schism’ and ‘Regenesis’, and his ‘Tabula Rasa’ arc picked up elements set up by Rick Remender in his ‘Uncanny X-Force’ run. It does mean that the Gillen era is sometimes a little dense; however, coming as it does at the close of an arc that had run since 2002’s ‘Decimation’ plotline, that’s little surprise. Gillen’s fascination with Marvel Cosmic is seen rather prominently in his run. Breakworld, Unit (who he created in his short-lived ‘S.W.O.R.D.’ series), the Phalanx, and the Celestials; Gillen happily draws upon the widest X-Men universe, with Cyttorak and Tabula Rasa thrown into the mix as well. Abigail Brand of S.W.O.R.D., one of the writer’s favourite characters, appears as a frequent background character. Gillen’s run was actually the only one that really understood WHY the Phoenix Force was going ballistic in AvX! Yes, in this scene Cyclops is actually comparing Utopia to Iraq! The second theme of the Gillen run is simply extinction. With the mutant race on the edge of extinction, Gillen piles on the pressure; the approach of the Juggernaut almost causes the humans to betray the X-Men, Cyclops names his band the Extinction Team, and many of the X-Men’s enemies are wrestling with the issue themselves. Breakworlder society has fallen apart, Sinister is both the first and last of a new self-created race, the Phalanx is the last of its kind, Unit is the last thing left behind by a race long-extinct… In the face of extinction, Gillen asks, what should the X-Men do? Their enemies all present different paths, and Cyclops must choose which one to follow. ‘Uncanny X-Men .1’ (#534.1): As an introductory issue to the Gillen run, this focuses in on Magneto and uses him as the centre of an age-old question: is it better to be loved or feared? ‘Breaking Point’ (#535-538): Breakworld society is fragmenting, and the remnants arrive claiming sanctuary with the X-Men. ‘Losing Hope’ (#539): Hope is kidnapped, and Wolverine must pursue her, in an issue that explores the relationship between Hope and Logan and is essential in setting up ‘AvX’. ‘Eulogy’ (#544): In the aftermath of ‘Schism’, the X-Men go their separate ways and a series ends. ‘Everything is Sinister’ (#1-3): Sinister unveils his plans, drawing the X-Men into a confrontation with a Celestial. ‘A Phalanx of One’ (#4): A lone Phalanx being, long imprisoned by Sinister, attempts to reach out to its race. ‘Tabula Rasa’ (#5-8): Psylocke takes the Extinction Team to the land of Tabula Rasa, where they uncover the secrets of what was once the World. ‘Prison Break’ (#9-10): The alien Unit orchestrates an escape from S.W.O.R.D. in order to get close to Hope. ‘Avengers Versus X-Men’ (#11-13): Gillen charts events during the first phase of AvX. ‘Everything is Sinister: Redux’ (#14-17): The Phoenix Five hunt down Sinister – who has prepared for them. 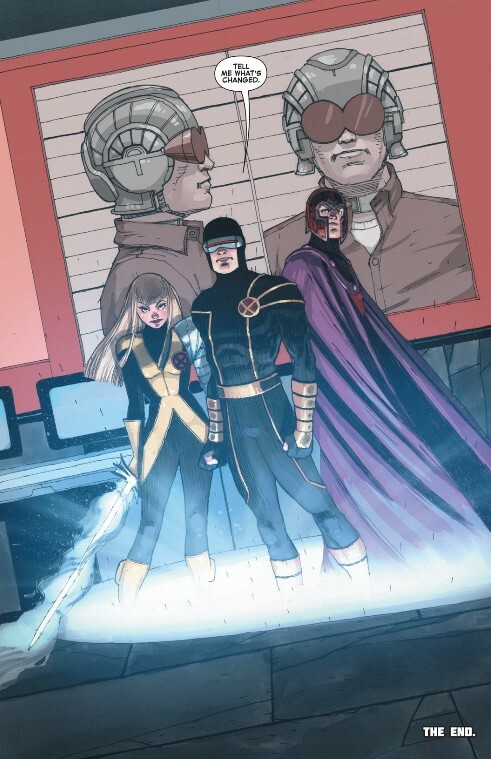 ‘The Passion of Scott Summers’ (#18-19): A two-parter exploring the consequences of AvX, alongside Cyclops’ perspective. ‘The Fallout’ (#20): Explores the fallout from Gillen’s run. 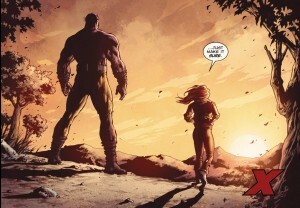 ‘AvX: Consequences’ miniseries: A conclusion to the entire Gillen run, establishing the new status quo for key members in order to set up the post-AvX mutant race. Today, I’m going to look at a handful of the central Gillen cast! Gillen charted an interesting course for Scott Summers. He was aware from the outset that Scott would wind up in a position where he was very much isolated, and set this up brilliantly; the events of ‘Fear Itself’ include people Cyclops had come to trust proving willing to compromise in ways he feared. This added an extra depth to the events of ‘Schism’, and gave real justification for Cyclops’ decision to form the Extinction Team. Gillen took the X-Men to the next level in the second series of Uncanny X-Men! 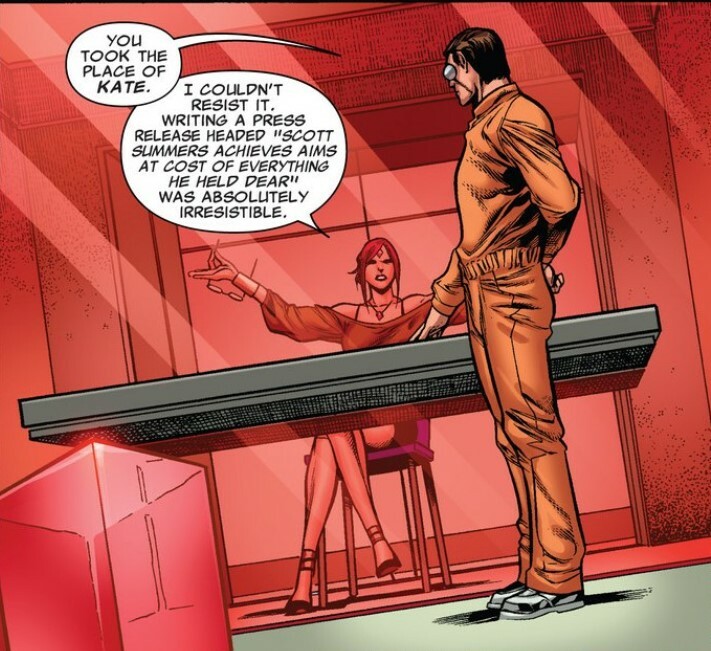 Gillen’s Cyclops had flashes of self-awareness – witness the argument he poses to Storm in order to get her on the team – but simply becomes too focused on his goal. His relationship with Emma Frost is fractured by his single-mindedness; as Emma recovers from the events of ‘Everything is Sinister’, Cyclops watches her exercise and thinks about how the Extinction Team need a mission. It is Namor who expresses concern, and this culminated in Gillen’s reworking of the Frost-Namor kiss in ‘The Passion of Scott Summers’. The crowning moment of Gillen’s run is undoubtedly the moment when, in ‘Fallout’, Sinister confronts Cyclops and tells him he has achieved his aim at the cost of everything he ever held dear. Gillen can even use the mouth of SINISTER to make his points! In ‘AvX: Consequences’, Gillen gets to finish the story he has told; he positions Cyclops in place for Marvel NOW!, in a deep character piece. ‘Fear Itself’ brought Colossus into a central role, with Colossus taking on the mantle of the Juggernaut. Gillen had felt this most noble of the X-Men needed to have his goodness truly tested, and from the outset had known the course this would take. 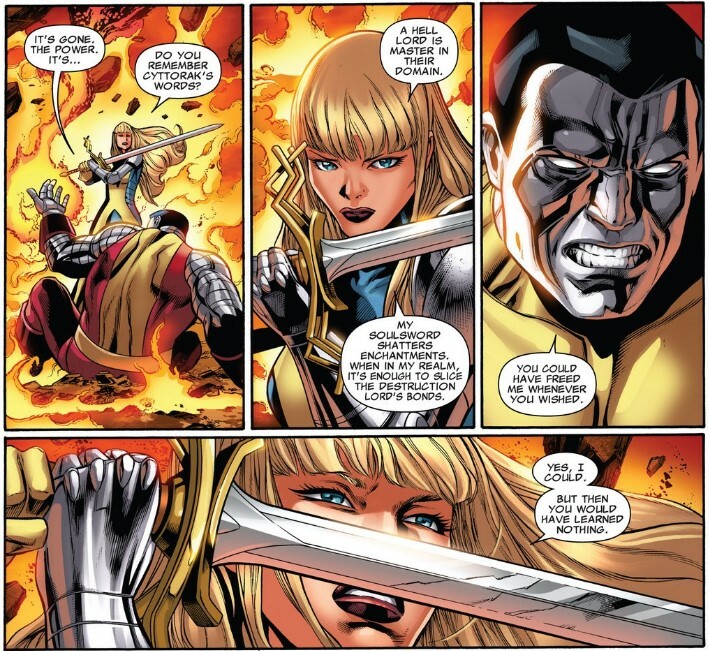 Every interaction between Colossus and his sister Magik was written with the conclusion in mind, and I strongly recommend rereading the whole series in the light of ‘Fallout‘. A chilling moment that Gillen had planned all along! I laughed so much at this scene! 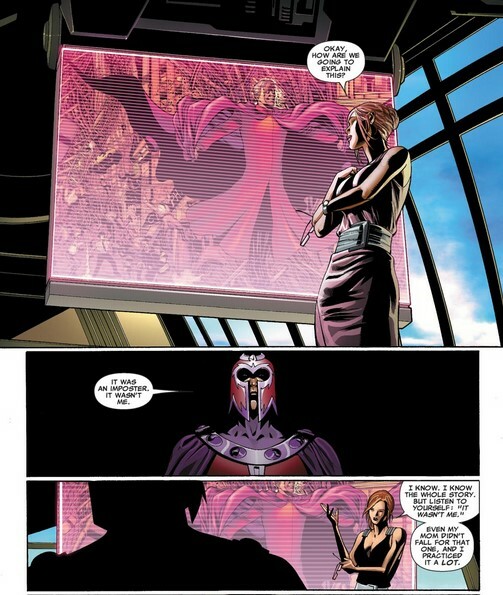 And yet, curiously enough, Magneto increasingly becomes the conscience of the team. He is left a bystander in ‘Avengers Versus X-Men’, and increasingly uncomfortable as he watches the actions of the Phoenix Five. The Gillen run is an unusual one, in that it was essentially dictated by a series of overarching narratives; rather than resist this, however, Gillen wisely chose to integrate them into his own stories. ‘Fear Itself’ established one of his central character arcs; everything in his run heads towards the events of ‘Schism’ and ‘AvX’, right down to ‘Losing Hope’ setting up Wolverine’s role in that event (even if the issue does rather read like an extra issue of ‘Generation Hope‘). Hope accepts that if things go wrong, Wolverine will put an end to her. It’s a vital moment for understanding AvX. For all Gillen’s mastery of continuity, one problem did arise; because Gillen’s ‘Fear Itself’ arc was still being published at the time Jason Aaron was writing ‘Schism’, you have the awkward oddity of a pre-‘Fear Itself’ Colossus appearing in ‘Schism’, which is clearly set after that arc. There is no simple fix, and you can only ignore that issue. The Gillen run is unique, and plays a vital role in charting the history of the X-Men. It is essential reading for ‘AvX’, with every arc leading into that event and Gillen himself penning the conclusion. It is unusually cerebral, with themes of power and fear threaded through the entire run. Unfortunately, it also seems to be easily overlooked by X-Men fans, largely because it slots so effectively into the broader narrative. How does this run fit with Schism and AvX? I read somewhere that this makes Schism and AvX more enjoyable. I was thinking of reading some modern X-Men and wanted to know the best reading order.